Ready for a Straighter, More Confident Smile? You want straighter teeth, but don’t want to display a mouth full of metal. We understand. Offered by our dentist in Danbury, CT, Invisalign is a clear alternative to braces that gently guide your teeth into perfect alignment—without any metal wires or brackets. Invisalign is a revolutionary technology that straightens teeth using clear, custom aligners. This means no metal to irritate your mouth, and best of all, no one will notice you’re in treatment. And treatment itself is typically completed much faster than using traditional braces. 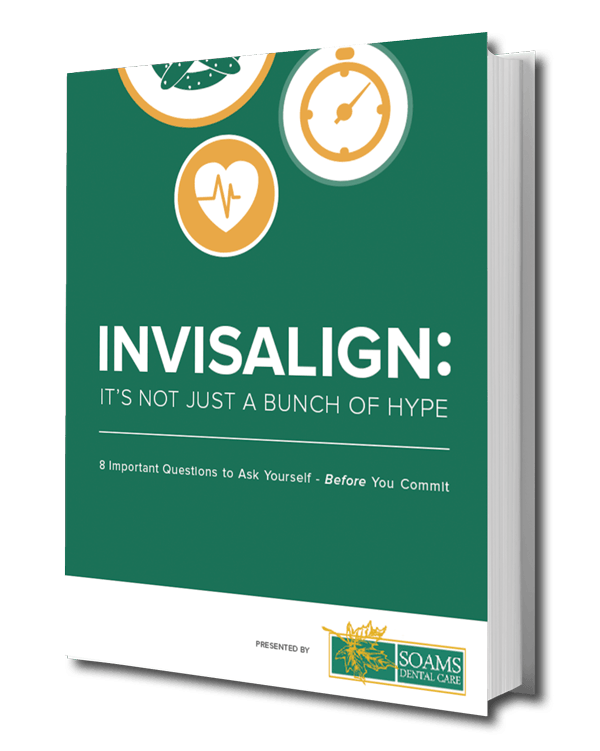 Please download our FREE ebook– Invisalign: It’s Not Just a Bunch of Hype. It outlines eight essential questions you should ask yourself before you commit. Also, don’t forget to ask how you can receive a $500 discount on Invisalign! Almost anyone is an ideal candidate for Invisalign, making it today’s preferred choice for orthodontic treatment. Virtually any condition that could be treated using traditional braces can be done with Invisalign. In fact, it has helped hundreds of thousands of teens and adults achieve amazing, perfectly aligned smiles. If you’d love a bright smile full of straight teeth, consider Invisalign by Danbury, CT dentist, Dr. Gerfen. Schedule your consultation at Soams Dental today! Receive $500 off your Invisalign treatment. Call us today!